With an impressive number of Koreans arriving in the Philippines topping the country'ss list of inbound tourist traffic in mid-year, the Philippine Department of Tourism (DOT) had pushed for the opening of its DOT-National Tourism Organization (NTO) office in Seoul on Sept. 15. Philippine DOT Secretary Joseph Ace Durano arrived in Seoul to lead the launching ceremony held at President Hotel in Downtown Seoul. The event also marks the secretary's third visit to Korea this year— a gesture of strong support and unabated interest in the Korean market which is now making a dramatic and visible presence in the Philippines travel trade industry. Secretary Durano earlier attended the Daegu Expo in April in which the Philippines won the best tourism promotional award, and the Korea World Travel Fair in June where he was invited as a special guest of honor. The new tourism office signals Philippines' all out effort to focus on the highly promising Korean market. 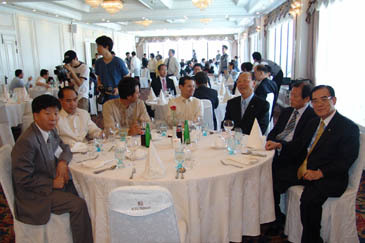 Following the restructuring of its regional marketing arm— the Philippine Visitors and Conventions Bureau (PVCB) in Seoul early this year and appointment of an onshore marketing representative and local marketing manager, there'ss no turning back for the Philippines in its quest to bring in home a huge number of Korean tourists to its exotic tropical destinations. As of July this year, Koreans to the Philippines totaled 47,265, accounting for a notable 51.7 percent increase from 31,148 a year earlier. The figure already indicates that Koreans now topped the list of foreign visitors in the Philippines overtaking the United States and Japan, respectively. Korea provided the largest share of tourists for July, while American guest arrivals recorded at 45,076 or 12.2 percent growth rate from last year's 40,165. Japan's statistics also rose to 35,381, up by 4.8 percent from last year's 33,763. This significant development is changing the overall inbound tourism landscape in the Philippines which is used to be dominated by American and Japanese guests. Turning into much-desired destination for Koreans, the Philippines has also attained a 29.5 percent growth rate in Korean visitor arrivals from January to July of this year compared to the same period in 2004. Maricon Ebron-Basco, PCVC Korea marketing representative is cautious, however, on the market trend. She said that Korea, the US, and Japan markets will continue to grow next year but will pose moderate increases. 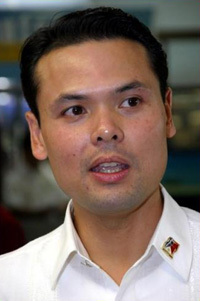 This prompts the Philippine government to target market segments with higher yields. In Korea, she said DOT has to target the convention and incentive market and course program in secondary and tertiary source destinations. Ebron-Basco said the opening of the DTO-NTO office in Korea is very significant because it will give a strong signal to Korean travel trade that the Philippines is serious in targeting Korean outbound travelers by putting in place the office that would cater to the info needs of the market. "Queries about destinations will be answered and new travel opportunities will be given a boost." she said. 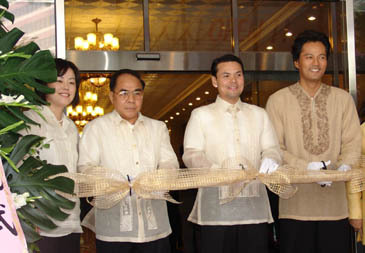 Along with the opening of a regional office in Seoul to maintain the upbeat Philippine tourism is the appointment of Korean actor, Kim Sung-min, as a special Philippine tourism envoy. Durano earlier stated that his involvement in the campaign will enable the DOT to entice more Korean tourists to visit the islands. Ebron-Basco also said she believes that the famous actor will help a lot in luring Korean visitors to the idyllic Philippine destinations. "I believe that the entry of Kim-sung-min into the picture will be good for the Philippines. I understand that he is well-known locally and hopefully. With a 30-second TV commercials on the Philippines, it will entice more Koreans to visit the islands," she said. Sec. Durano (second from right) poses with others. Durano is very optimistic in the continuous surge of Korean tourists to the Philippines. This year the Philippines targets to attract 2.5 million foreign tourists, and based on a DOT statistics, a total of 1,340,604 tourists has been registered. Durano said that this early, the numbers have been explicitly showing that the target this year is within grasp. 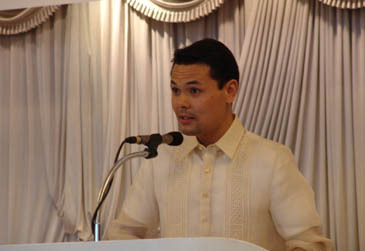 The mid-year figure indicates that Philippines has already met 54 percent of the target. With an ever-growing competition to corner the lucrative Korean market, the Philippines is now capitalizing on its strength as a unique tropical destination. Fully aware of the "well-being" craze in Korea or the trend towards a health-conscious lifestyle, the DOT is pushing for an aggressive campaign with the private sector to develop the country as a health and wellness destination. The DOT is positioning the Philippine islands as a heaven for health and wellness buffs. Basco-Ebron said that all facilities that would cater to these market segments are now put in place citing. There are vast destination for spa facilities, a number of Filipinos who are trained to give unparalleled service, and a big number of medical practitioners who are into the field and who can share their expertise in promoting wellness programs. 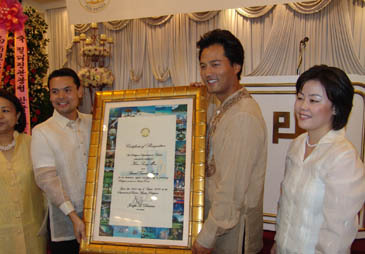 Joseph Ace Durano, Philippine DOT Secretary and South Korean TV actor Kim Sung-Min are in full smile. At right is Ms. Kim Min-Hye, manager of the Philippine Toursim Office in Seoul. Notwithstanding the ongoing political turmoil in Manila, the country's capital, Durano said tourist arrivals rose by 14 percent from January to July this year 8212;a strong show of tourists's undisputed interest to the islands. During the past years, the Philippine tourism has capitalized in promoting major and well-known destinations including big names like Boracay, El Nido, or Cebu Island, along with other destinations from north to south like Laoag, Vigan, Baguio, Subic, Tagaytay, Bohol, Davao, and more. Recently, however, DOT has been keen in developing emerging destinations as well as to restore interest in traditional destinations. This year, DOT is also back in promoting Southern Tagalog and Bicol regions. Durano said these regions have drawn influx of foreign tourists with re-emerging interest on Lake Buhi, the islets of Caramoan, and Mayon Volcano. 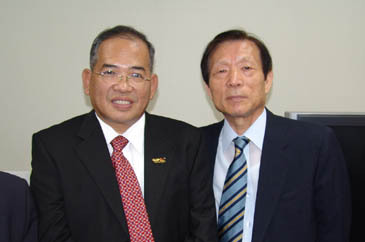 Mr. Mihn Byung-Il (right) of The Seoul Times poses with Mr. Abdul Mutalib Awang, director of Tourism Malaysia in Seoul. Durano also highlighted a number of eco-tourism sites like Bac-Man geothermal production area which include the Botong Twin Falls, Bat Sanctuary, Inang Maharang Mud Pool, and Nag-aso Lake. The 150-megawatt geothermal production field situated around the boundary of Bacon in Sorsogon and Manito in Albay opened in 1993—overlooking Mayon Volcano, Albay Gulf, Bulusan Volcano, and Sorsogon Bay. Along with the development of new destinations, the DOT has been drawing up plans on accessibility and accommodation. Durano underscored the need for more chartered direct flights from Incheon to these destinations. Currently, PAL operates Korea-Cebu direct flights. Durano said air carriers need to expand routes including Palawan, Negros Occidental, and other big potential destinations.